The issue of fixing in tennis is one that I have focused a lot on in the past eighteen months. From looking at some of the reasons that players on the lower tours might be tempted to fix outcomes to highlighting some of the more blatant fixes (Westerhof and van der Duim, Molchanov and Kicker), it is an area that I feel is of concern for not only tennis, but sport in general. With the rise of sports betting at the lower levels of sport, the temptation to fix outcomes for financial gain becomes more appealing to some individuals. With my background, I have a decent understanding of fixing and the threat that it poses to tennis, however, I thought it would be interesting to try and get an idea of the wider perceptions of fixing in tennis among fans, traders and journalists. To achieve this, I created a simple survey and encouraged people to complete it. The response to the survey was far greater than I expected. Once clearly fake responses were eliminated, there were 402 completed surveys left. Of these, 49% classified themselves as 'Tennis Fans', 46% as 'Tennis Gamblers/Traders', 3.5% as 'Journalists' and 1.5% as 'Current or Former Professional Players'. There were completed forms from 43 different countries - the majority being from the UK, USA, Canada and Australia, but there were completed forms from all over the world, ranging from Bosnia and the Brazil to Vietnam and the Dominican Republic. How serious a problem is fixing? We can see that there are relatively different perceptions of how serious the fixing issue is at the varying levels. The WTA is perceived to have the smallest problem with almost 31% of people believing that there is no problem with fixing. The ATP is not far behind with 22% of people believing there is no problem and another 46% believing there is only a minor problem. However, when we move down to Challenger and Futures level for the men, there is a different story. Only 2% of people believe that there is no problem with fixing at the Challenger level with 47% believing that it is a serious problem. At Futures level, 4% believe there is no problem, but 48% of people believe that it is a serious problem. Given there were 18% that said they did not know that that level, it means that well over half of all those answers where people felt they had an opinion felt that it was a serious problem. That surely has to be a concern for the perception of the lower levels of the sport. The outcome for the ITF events for women is interesting as well. 37% of people did not know, while there was a relatively even split across the other four options, suggesting that there is really very little idea of the scale of fixing for the women at that level. Generally, in all of the different levels, those that classified themselves as tennis traders or gamblers felt that there was slightly more of a problem than those that classified themselves as tennis fans, while among journalists, there was less of a perceived problem in the ATP/WTA compared to the overall average, but more of a perceived problem at the lower levels. How many players have been banned? The most popular response was 4-6 with just under 31% of completed forms choosing that option. In actual fact, there have been 14 players that have been given bans by the TIU since 2008 for corruption offenses, plus one official. Of those 14 players, there have been four life bans (Daniel Koellerer, David Savic, Andrey Kumantsov and Sergei Krotiouk), four bans for a period of two years or more (Guillermo Olaso, Ivo Klec, Piotr Gadomski and Arkadiusz Kocyla) with five bans of six months and a one month ban. Of these, they were not all offenses involving fixing match outcomes, but they were all banned for corruption offenses. What type of fixes occur? The next question started to delve a little deeper into how tennis fixes were perceived to be carried out. While the most commonly known fix involves fixing the actual winner of the match, this arguably contains the greatest risk, given that the entirety of the match needed to be scripted. Whilst it may also be the easiest fix to hide due to the fact that there is more money in the betting market for this, it also generally marks the end of a player's involvement in the tournament and limits any further prize money from the event. There are a number of alternative types of fixes though that can earn an unscrupulous player additional money, whilst not guaranteeing that he loses the match. This could vary from fixing individual sets, particularly the first set (there have been indications that this may be happening at ATP level in recent weeks), fixing correct scorelines in sets, fixing individual games or points, or if both players are involved in the fix, fixing the opening two sets of the match before playing out the third set to determine who progresses in the tournament. We can see that fixing individual points is felt to be the least common type of fix, which seems logical. In terms of the other four types of fix, there seems to be a perception that fixing the outcome of the match and fixing individual sets are the most common type of fix. Who is behind the fix? Having determined that the majority of people feel that fixing does happen in tennis, albeit to varying extents, the next question attempted to determine who was actually behind the fix. Obviously, the players on the court are the ones that actually carry out the fix, but who was the mastermind behind the plan? We can see that almost 65% of responses believed that the players themselves were behind the fix. In this case, we are looking at the fixes being carried out solely for the financial benefit of the individual player or players involved in the fix as opposed to there being any organised match fixing ring involved. Betting syndicates come out of this in a relatively negative light with over 13% believing that they are behind the fixes. This is perhaps related to the fact that betting syndicates are generally seen in a negative light and are often misunderstood by the wider public. 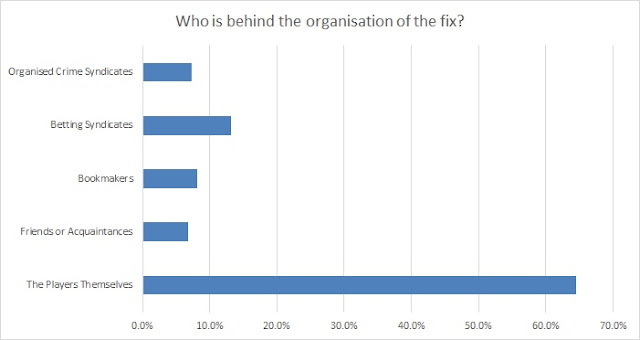 There appears to be only limited belief that organised crime is behind fixing in tennis, while over 8% of forms believed that the bookmakers themselves were orchestrating the fixes. One particularly interesting form actually suggested that umpires themselves might be behind the fixes, which is actually a very plausible answer. What would help to combat fixing? The first option was to ban betting on the minor tours completely. Almost 28% of responses felt that this would help, which is almost certainly true. However, the reality is that this is simply not a feasible option. Almost 40% believed that increased funding for the TIU might help, but only just under 11% felt that it would definitely help, which only serves to highlight the lack of confidence in the TIU in terms of combating fixing in tennis. That barely one in ten replies feel that they would do a better job with increased funding suggests that there is a sense that they are simply not able to make a dent in the problem in their current form, regardless of resources. 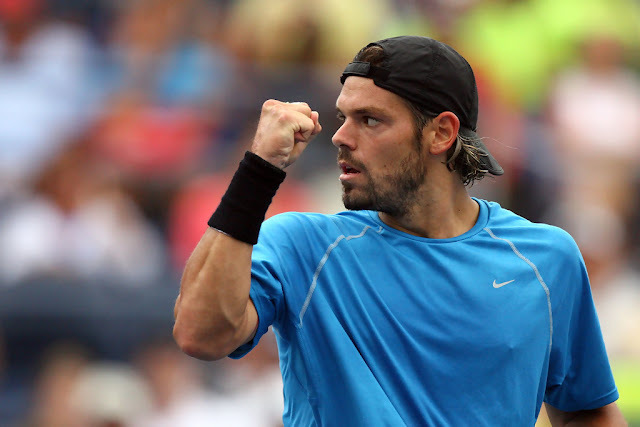 "I've heard Molchanov in particular, in the past, say that he did not necessarily frown upon it (fixing). He never at any point in time said that he was going to do it, but he would be one of the guys in the conversation saying - not that he would do it, or he supported it - but almost trying to justify it because it's tough financially." However, the question must be asked as to whether players would still continue to chase the additional income through fixing even if prize money increased. The two options that are seen as the most effective tools in combating match fixing in tennis are those that involve the two groups that should have the greatest knowledge and ability to spot fixes - the bookmakers themselves and tennis traders. Over 35% of responses felt that greater cooperation between the ATP, WTA, ITF, TIU and bookmakers would definitely help to combat fixing. This seems obvious as it is the bookmakers that are taking the bets on the fixed matches, so by not using this information, it is almost impossible to catch fixers. Having worked for a bookmaker myself, I have reported matches that were almost certainly fixed, but no response was ever received and no further information was ever requested. 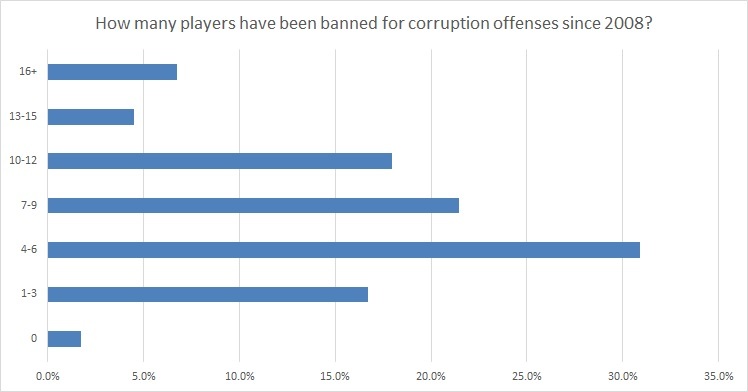 Safe to say that none of the players involved have ever been sanctioned for corruption offenses. The other popular option is to harness the knowledge of professional tennis traders to help detect fixes. Tennis traders spend hours each day following the markets and they can detect very quickly if something is wrong in a market. This does not necessarily indicate a fix, but it can be used to highlight matches for further investigation or players to focus on. There is virtually no information available about the investigators at the TIU, but it would be very interesting to know whether they employ anyone with a background in either bookmaking or tennis trading. Perhaps unsurprisingly, these latter two options were very popular among those respondents that classed themselves as tennis gamblers or traders, but even among those tennis fans and journalists, they were two of the most popular options. 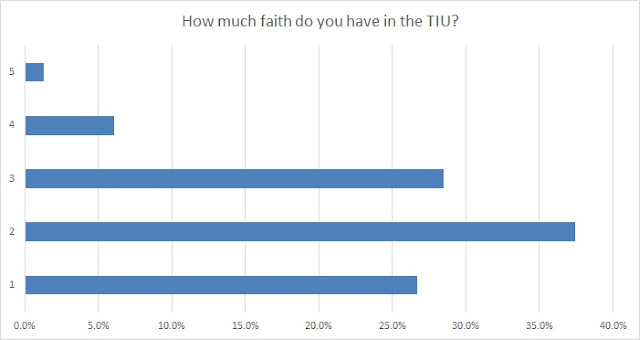 How much faith do you have in the TIU? "From the chatter around the guys, it sounds like it's something that definitely happens, and quite often. It happens, and there's not a whole lot anyone can do about it"
If players themselves feel that there is not much that can be done about it and that reporting to the TIU achieves nothing, then the disincentive to fix becomes far smaller. We have already seen earlier that barely one in ten felt that extra funding for the TIU would help and the results here show the lack of faith in the organisation. Almost 27% of completed forms said that on a scale of 1 to 5, with 1 being no faith and 5 being completed faith, they had no faith in the TIU to reduce the problem of fixing in tennis. With another 37% scoring the TIU as a 2, it means that almost 65% of people lack any real faith in the TIU reducing the problem of fixing. The TIU may do a lot of good work behind the scenes, but their highly secretive nature means that their public perception is not good at all. The final question focused on the level of proof that should be required for the TIU to impose a ban on a player. The two options were taken from the legal system. 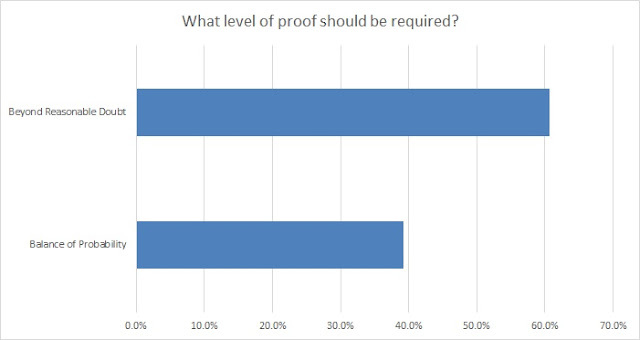 The first was 'Beyond Reasonable Doubt', which is generally the level of proof required to validate a criminal conviction in most legal systems. It places the burden of proof on the shoulders of the prosecutor, who must prove that a player has fixed an outcome to the extent that there could be no reasonable doubt in the mind of a reasonable person. The second option was 'Balance of Probabilities', which is more commonly used in civil disputes, which requires that the dispute be decided in favour of the party whose claims are more likely to be true. To prove beyond reasonable doubt that a player has fixed an outcome is very difficult. Unless you have bank statements showing money from a bookmaker or phone or text records proving a fix took place, it is almost impossible to prove beyond reasonable doubt, even if the betting markets strongly suggest that the outcome was fixed. Just over 60% of forms felt that fixes should be proven beyond reasonable doubt in order to impose a ban on a player. Among tennis fans, this proportion increased slightly to 64%, while among gamblers and traders, this decreased to 55%, but both still had a majority that felt that it should be proven beyond reasonable doubt. Among journalists, this proportion increased significantly to almost 77%, while it was almost unanimous among current or former players that it should be determine on beyond reasonable doubt. This article was simply designed to give an overview of the outcome of the survey and try and get an idea of the public perception of fixing in tennis. I will be writing another article later this week that will look in more depth at some of the excellent suggestions and ideas that came up in the survey on how to combat the problem of fixing in tennis.